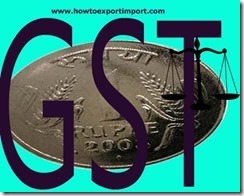 In imports, IGST is computed on transaction value of imported goods plus duties and taxes etc. charged under any statute other than the GST Laws. Here in imports, Integrated Goods and Service Tax IGST is payable for each and every import transaction before taking delivery of imported goods. Integrated Goods and Service Tax IGST is payable for each and every import transaction before taking delivery of imported goods. Whereas IGST is paid monthly along with returns of IGST against domestic movement of goods and services. Chaitanya P: On 01 June 2017 After reading provisions for both Job Working and Works Contract, how will a subcontractor undertaking Works Contract for a Principal Works Contractor be treated? Will he be treated as a Job Worker or a Works Contract Service Provider? What if the Subcontractor taking up work only in respect of service and the material is supplied by the Principal?